James McNeill, who was awarded the George Medal for his efforts, praised the bravery of his crew. A rescuer has told how he and his boat went through the flames to rescue survivors of the Piper Alpha disaster. James McNeill, who was awarded the George Medal for his efforts, praised the bravery of his crew on the night of the tragedy. Mr McNeill said he and his crew were not heroes and were only doing their jobs. Speaking to STV 25 years on, Mr McNeil said: “It was about 10pm, we were talking to the rig and all of a sudden there was a puff of smoke and an explosion and they pressed the alarms. “I took the fast boat and we were under the rig in 30 seconds and it was an inferno as quick as that. “We just went straight in there, and when we went in there was one fella on the spider deck and he was the first man off and then we started circling the rig. He and his crew went through the flames on at least five occasions to rescue survivors. “You were running on adrenaline... when we went in we saw one fella under the rig through the legs of the rig and I said to the lads, 'we’re going in that way',” he said. “You don’t think [of your own safety]. I have been at sea too long and there is an unwritten law that you go in and try at least to help your fellow man,” he said. 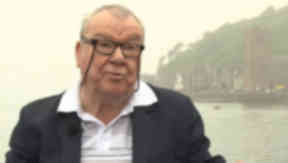 Mr McNeill said it was difficult to hear due to the roar of the flames around him as they pulled survivors from the sea. Mr McNeill says after all these year he still has vivid memories of Piper Alpha and refuses to accept plaudits that he and his crew were heroes on the night in question. “You try to put it at the back of your mind now because it is 25 years after all, it will never go away but you’ve got to just try day to day,” he added. “I was just doing my job, that was our job anyway so we had to try and get as many as possible, as we could, and we did that until we were blown up ourselves when the gas line blew up under us. “I remember it as just a nightmare, what we went through. I was more sorry for the young lads, my crew, but without that crew we wouldn’t have saved as many because they were very, very brave and they followed me through it all,” Mr McNeill said. Your report:** *If you have information on this or any other story, please let us know. You can send information, pictures to web@stv.tv or call us on 01224 848918.